For some of us, coconuts conjure up images of palm trees and tropical locales. For others, they take us back to mouth-watering memories of our mother’s home-baked coconut cream pie – or even the sweet, gooey center of our favorite childhood candy bar! But did you know that besides tasting delicious, the oil pressed from the meat of the coconut contains numerous health benefits, for people and companion animals? Let’s take a closer look at coconut oil and why you should consider adding some to your pet’s diet. Ben’s Barketplace recommends a daily intake of coconut oil for many reasons. If it’s saturated, isn’t it bad? Fats are made up of fatty acids that fall into three categories – monounsaturated, polyunsaturated and saturated. Saturated fats, which are predominantly found in animal products such as meat and dairy and are solid at room temperature, have been linked to a host of health issues in people such as obesity, high cholesterol and increased risk of heart disease. As a plant-based saturated fat, coconut oil was once grouped with other unhealthy fats, and people were advised to avoid consuming it. 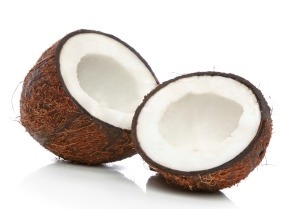 However, even though coconut oil is a saturated fat, it is not unhealthy. In fact, it contains numerous health benefits! The chemical structure in coconut oil is quite different from the fat found in, say, a steak or a slab of butter – and that difference has huge implications for our health and our pets’ health. Whereas most saturated fats are comprised of long chain fatty acids (LCFAs), coconut oil is comprised mainly of medium chain fatty acids (MCFAs), or medium chain triglycerides (MCTs). Our bodies metabolize (break down) and recognize medium chain fatty acids differently than long chain fatty acids, producing a very different effect. There are many reasons to let your pet indulge in some coconut oil every day. For example, we now know that, unlike animal-based saturated fats that contribute to heart disease, coconut oil is actually heart healthy! Coconut oil also contains lauric acid, a saturated fatty acid that converts in the body to monolaurin, a monoglyceride compound with numerous beneficial properties, including anti-viral, anti-bacterial, anti-microbial, anti-fungal and anti-protozoal. Lauric acid actually destroys lipid-coated bacteria, fungus and viruses such as herpes, the measles, influenza, hepatitis C and HIV, ringworm and athlete’s foot. But of all these benefits, my favorite is that coconut oil is scientifically proven to improve brain function in older dogs – findings that have important implications for people and animals. In one study, 24 senior Beagles fed a diet supplemented with 5.5% MCTs showed significant improvement in cognitive ability within just one month. The study’s authors concluded that the MCTs (as contained in coconut oil) provided an alternative source of brain energy for the senior dogs. • Unlike regular fats (which the body metabolizes slowly), MCTs break down and absorb rapidly into the bloodstream, providing a quick source of non-carbohydrate energy.• MCTs readily cross the blood-brain barrier, supplying up to 20% of a normal brain’s energy requirement. • MCTs are important for ketone production, which serve as an additional source of “brain food”. When purchasing coconut oil, opt for unrefined, cold-pressed varieties. If possible, choose organic brands to avoid potential contamination from pesticides. Coconut oil does not need to be stored in the refrigerator, but since it is light sensitive (like all oils), it’s best to keep it in a dark cupboard. Dark glass containers are excellent storage choices, as they protect the oil from light while also ensuring that no BPAs (harmful chemicals found in many plastic containers), leach into the product. There are many ways to incorporate coconut oil into your pet’s diet. Try mixing a tablespoon into some sheep’s milk yogurt or adding a dollop on top of some fresh organic blueberries. You can even scoop it straight from the container and let him lick the spoon. Pets love the taste! Studies show that coconut oil fed as 10% or less of your dog’s diet poses no digestive or other health issues. However, since too much coconut oil can cause diarrhea, I advise exercising common sense and introducing it to your pet slowly. Aldrich, G, 2009, ‘MCTs an overlooked tool in dog nutrition’. Feedstuffs, 81(35) :10. Laflamme, DP, 2012, ‘Nutritional care for aging cats and dogs’. Vet Clin N Am: Sm An Pract, 42(4): 769-791. Pan, Y, Larson, B, Araujo, JA, Lau, W et al, 2010, ‘Dietary supplementation with medium-chain TAG has long-lasting cognition-enhancing effects in aged dogs’. Brit J Nutr, 103 (12): 1746-1754. We have coconut oil available at Ben’s Barketplace everyday! 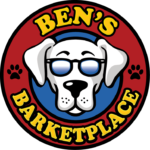 Discover more about owning your own Ben’s Barketplace franchise.